Back in May of 2009, I attempted the preliminary portion of the million dollar challenge hosted by the James Randi Educational Foundation. You can read the full article by clicking here. Ghostly characters lurking in the corridors and cellars of the Horse and Groom Pub, Braintree. You can see the newspaper version here. 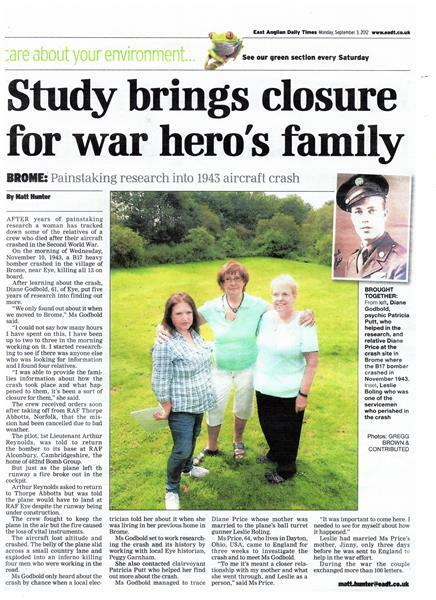 Documented by the East Anglian Daily Times, I helped bring closure to a war hero's family. You can read the full article by clicking here or see the newspaper version here. Here I was filmed and interviewed by Tim Samuels while carrying out an exorcism at a Shoe Menders (Cobblers) in Bexley High Street. 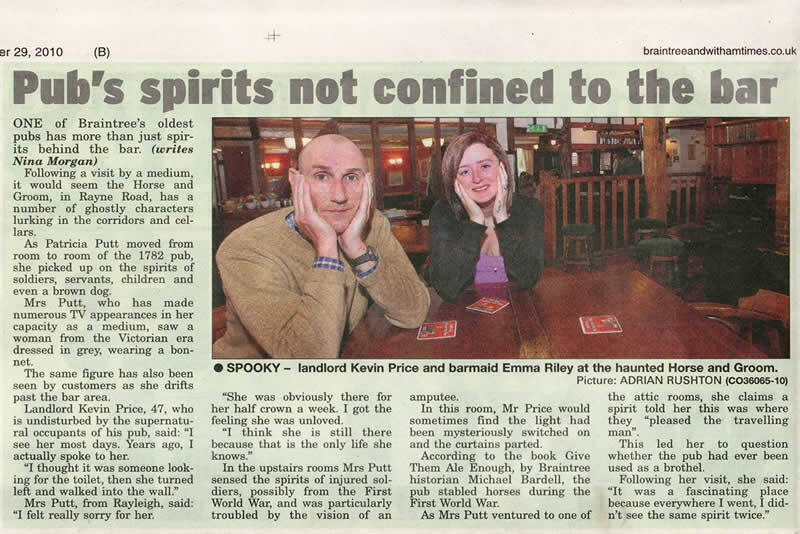 As ever intent on providing it’s readers with a chilling Hallowe’en tale, the Courier’s Kim Gandy drove psychic Patricia Putt, without giving her any prior information, to England’s most haunted inn one dark, windy night. St Ann’s Castle, on the ancient thoroughfare that runs through Great Leighs, is, allegedly, the oldest inn in England, having been built around 1170. Its proximity to Leez Priory and the fact that it is bang in the middle of prime Essex witch country makes it a hotspot of spiritual activity, with more than its fair share of things that go bump in the night. When we were within a mile of our destination, Patricia started to complain that her legs felt weak and she became visibly uncomfortable as we pulled into the car park. As we approached the steps to the entrance, she declared that “they” wouldn’t let her enter. However, with the help of a bible and holy water, we gained admittance. I introduced Pat to the landlady, also called Pat and we set off on our psychic voyage. Our first stop was one of the bedrooms in which our medium heard a baby crying. Apparently this was emanating from a tiny anteroom. She picked up on the fact that the mother of the child was also present and asked the landlady if she’d recently rearranged the room and why. The landlady stated that she had indeed rearranged the room at 2.30 that very morning, having felt a huge compulsion. The spirit mother had, it seems, compelled her to do it, as the room layout had interfered with the positioning of the child’s crib. In the next bedroom, Pat saw a man dressed in hunting gear, apparently of the year 1380; as she was stating that she felt the man had followed the black arts, a crash of thunder and flash of lightning shattered what was left of my composure, sitting, as I was, just three feet away from where Pat had claimed to have seen him. At this point, I retired, quivering, to the landing. Throughout the investigation, Pat perceived the presence of monks but described their behaviour as anything but Christian. She ‘felt’ the presence of nearby Leez priory, even though not particularly familiar with the area and having been driven there in the dark. In the main bedroom, a royal connection came through, with a strong sense of Anne Boleyn and Elizabeth 1. (The Queen Anne is reputed to have stayed in this room: although the others may have, it is not documented.) The tragic nine days’ queen, Lady Jane Grey, Pat felt, had stayed here on her last journey to London. She then pointed to an area of the ceiling and said that a comprehensive search would turn up some “interesting documents”. As we continued around the upper floor, several details connected including the fact that the mother of the baby and the man in red and black had been linked and that this man had, in fact, strangled the woman. Later, Pat claimed to hear buzzing “like bees”, which is quit feasible as monks kept honey bees to make mead. Another spirit complained that she didn’t like her remains having been disturbed. This story is corroborated by the fact that there is, in fact, a piece of rock outside the pub, locally referred to as the ‘scrapfaggot (old name for a witch) stone’. This had been driven over by a Second World War tank and thereafter removed to its present position. After this occurrence, all kinds of strange events started to occur inside the pub, including clocks going backwards. The bathroom, it turned out, was the worst place in the house. Pat found herself drawn to an anteroom beyond the shower cubicle, which, after a couple of minutes she hurriedly left, claiming she could feel stabbing sensations and smell burning flesh. She insisted that awful things had happened and appeared reticent to go into too much detail. By now all the hairs on the back of my neck were on end! Our last port of call was the cellar and Pat claimed that she could ‘feel’ darkness (although it was lit) and wanted to ‘claw her way out’. The cellar is, in fact, the means by which the monks would enter and leave the inn, via, reputedly, two tunnels connected to the priory. After our chilling investigation we repaired to the bar - which is very much in the present, with its contemporary music and sceptical regulars - and the two Pats began to compare notes. As Pat the landlady already knows several psychics and has also compiled a history of the pub, she was able to corroborate much of what Pat the psychic had touched upon, including the presence of the woman and child and the connection with royalty. The scrapfaggot stone story is not widely known and the bathroom has been the room that most psychics have shied away from. Interestingly, the psychic had correctly picked up on spirits from different historical periods in the appertaining parts of the inn as, with most ancient buildings, some parts had been added over the centuries. Sceptical though I may have been to start with, the ghosthunting tour proved fascinating from a historical perspective. However, the accurate timing of the thunder and lightning shook me rigid. I thought that only happened in films! For the full background of this appearance click here. On the 30 May 2000 I was present at Hampton Court Palace when Dr Richard Wiseman was conducting an experiment into whether his scientific instruments could pick up on the Physical presence of Spirits. I did not say I was a Psychic, as this tends to colour people's judgment. Instead, I walked around the long corridor carrying out my own experiments, as usual I could see and feel a great deal more than Dr Wiseman or the other people taking part. In the room where we met he told us a story of a lady and her spinning wheel. I later faxed him to inform him that where he thought the spinning wheel to be was not correct, it had in fact stood where I was sitting. I also told him that the screams heard in the Long Gallery were not those of the lady everyone assumed them to be. As the experiment was coming to an end, a young gentleman asked if I would speak to him. This I did, only after I had answered all his questions did he inform me that he was a reporter from the Mail on Sunday (The Review) in his article on Sunday 11 June 2000 he mentioned my name and my findings. On the following Tuesday I received a phone call from Gloria Hunniford's programme "Open House" inviting me to take part in an interview with Dr Richard Wiseman and Ms Hunniford. This I did and it was most interesting. Because Dr Wiseman is a scientist he found it difficult to agree with me but I think he was definitely given something to think about. March 2000 when I was reported having discovered a very interesting history of a Pub in the village of Canewdon, Essex. On my first visit to The Anchor Inn Canewdon, I had seen a young girl dressed in Puritan costume standing in the corner. At the time I said nothing to the then Landlord of the Pub, as I felt he would not be interested. However, on my second visit I realised that there was now a new Landlord, on talking to his wife I asked if she was aware that there was a Spirit of a young lady in the Pub. She smiled and said she had heard the story but was loathe to believe. On my third visit I spoke to her husband who said that there was a room upstairs that was supposed to be haunted. I asked if I would be allowed to visit it. He agreed, we made our way up the stairs the minute I entered the room I could feel the presence of a frightened, young girl. As I also do Trans work, the young lady spoke through me. Giving her name as Catherine, not Sara as every one believed her name to be. She had been imprisoned by a very wicked Uncle in the seventeenth century (1660) during the time of the Witchfinder General. Treated as a witch she had died a very unhappy young girl. I gave a great deal more information, all of which was borne out by local Parish records. I gave dates, names and families even nationalities. I also believe that among the names that I gave one was actually the name of the man who beheaded Charles I. The Anchor Inn, Canewdon is full of history.